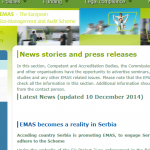 EMAS news from Serbia published on official EU EMAS web site! We proudly announce that EU EMAS official web site has published the news regarding EMAS Activities in Serbia. Title of the Article is: EMAS becomes reality in Serbia. Article contains the news regarding the project EMAS/IPPC/SEVESO and also information regarding EMAS Portal www.emas.rs.